The CHUB is 5U chassis suitable for ETSI or ANSI installations. The Chassis is designed to accommodate from 1 to 15 Networking, Telecommunication or Encryption modules from Engage Communication IP•Tube, IP•Express, Black•Bond and Black•Door product lines. The modules available are listed on the CHUB Order Form. Refer to the module Data Sheet for its specifications. A 5U high 2 inch (50 mm) wide Power slot accommodates 2 Hot Swappable Commercial, Industrial or Military Grade Off The Shelf 1U Chassis Power modules that are available as Universal 90/240 VAC 50/60 Hz, Isolated -48 VDC, or 12 to 30 VDC. Each of the Modules is independently managed via its Console interface or one of its Ethernet LAN interfaces. Each LAN interface features independent IP network configurations. Common management is easily achieved by collocating a Rack Mountable Ethernet Switch with a sufficient ports and the sophistication required for traffic isolation. The primary application is to compactly concentrate up to 60 T1 or E1 circuits that are extended over packetized networks such as IP, MPLS, Carrier Ethernet, cable HFC, xDSL, EPON/GPON, and fixed wireless: 802.11a/g/WiMAX. 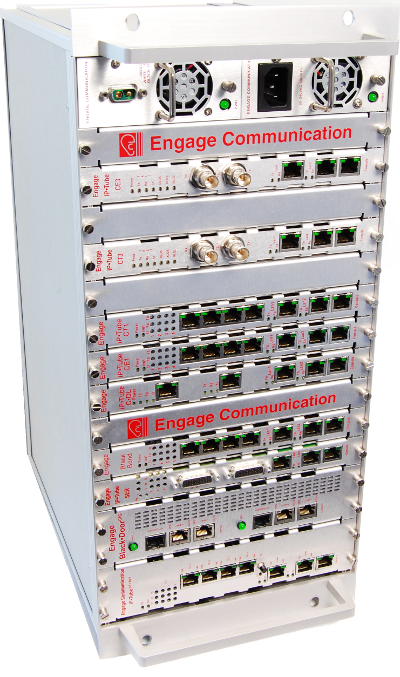 Engage's first deployment of the IP•Tube, in the Spring of 2000, was for an international interconnection of a Cellular Base Station to a Base Station Controller. Note: the power supply slot is 3.2 Wide x 6 Long x 1U high.